*Nov. 27 - Victoria’s Treats Café opens for breakfast and lunch at 104 W. Miller St.
* Dec. 2- Holiday Craft Sale- Wayne ARC, Van Buren Street- 9-12 a.m.
* Dec. 3- Friday- Open House at the Apple Shed- 5-8 p.m.
* Dec. 3 - Central Park Santa arrival on a horse drawn wagont, and tree lighting & Alex Eligh Holiday Party, Horse & Wagon Rides courtesy of Nothnagle agents. Donations of canned goods for the Newark Food Closet accepted. * Dec. 5, Sunday- 1-4 p.m.- Newark-Arcadia Historical Society Holiday Open House at the Marbletown Centennial Schoolhouse featuring holiday & craft vendors, bake sale. Located on the corner of Miller Rd. and Marbletown Rd. 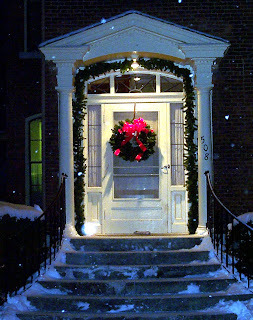 * Dec. 5, Sunday 1-4 p.m. Holiday Open House at Newark-Arcadia Museum, 120 High St. (holiday decorations, special exhibit) Live music 1-3, Museum Gift Shop featuring coverlets to calendars to books on area history. * Dec. 5- Noon to 5 p.m.- 30th Candlelight Tour, offering six homes of character decorated for the holidays in the Macedon-Palmyra area. Tickets $20- 315-597-3758- Presented by the 7th District Federated Garden Clubs of NYS. * Dec. 9, Thurs. 7:30 p.m. Newark-Arcadia Quarterly Meeting, special guest speaker Ed Varno, Executive Director Ontario County Historical Society, on "Roseland Park". Open to all. * Dec. 10 - Rochester Philharmonic at Newark High School- Pasta Dinner at 5-7 p.m., concert at 7:30 p.m.- Tickets available at Wegmans or the High School. * Dec. 10- Hickok Center for Brain Injury- Holiday Open House- Noon to 6 p.m.- Refreshments and door prizes. * Dec. 11- Saturday- Visit with Santa at the Apple Shed. * Dec. 11- Note change of date- WACK/Big Dog Country Radio Annual Children's Holiday Party- 9-12 at the Marbletown Fire Department, Silver Hill Road. Refreshments and $15,000 worth of toys given away, compliments of local merchants. See your local merchant for a letter from Santa for admission to the party. * Dec. 11 - South Main Emporium Holiday Open House- 10 a.m. with Merry Mischief Band playing from 3-5 - Refreshments all day. An eclectic mix of shops offering unique gifts, a seamstress and much more. * Dec. 11- Reliant Community Federal Credit Union- "Cookies with Santa"- Children get their photo taken with Santa, enjoy some cookies, and receive a small holiday gift. * Dec. 18 - First United Methodist Church- Annual Cookie Sale 10- noon "Cookies Good Enough to be Given as Gifts"
* Dec. 25- Annual Shared Christmas Dinner-First United Methodist Church 1 p.m. Deliveries available- Watch for details. 0 Comments to "Updated Newark Holiday Calendar"